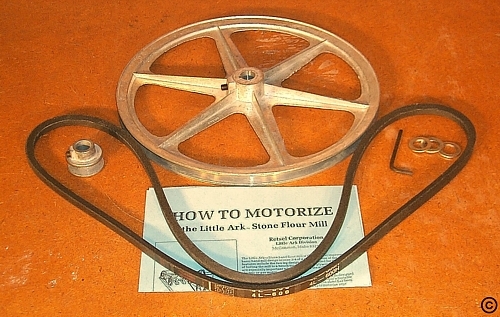 MOTORIZING KIT FOR BOTH THE UNI-ARK AND THE LITTLE ARK HAND MILLS. ALL YOU NEED TO DO IS TO SUPPLY YOUR OWN ELECTRIC 1/2 HP. , 1725 RPM ELECTRIC MOTOR. THIS MOTORIZING KIT WILL ALSO FIT ANY HAND MILLS ON THE MARKET WITH A 5/8 INCH DRIVE. COMES WITH ONE 12 INCH CAST IRON PULLEY AND A 1 1/2 INCH PULLEY, AND A 60 INCH V BELT. THE CAST IRON 12 INCH PULLEY HAS A 3/16 INCH KEYWAYS CUT IN IT AND IT TAPPED TO ACCEPT A SET SCREW. THIS FLYWHEEL CAN ALSO BE USED SEPARATELY ON THE MILL FOR EASE OF OPERATION, ETC. A 4 INCH HEAVY DUTY PHENOLIC HANDLE GRIP WITH BOLT AND WASHERS COMES COMPLETE WITH THIS FLYWHEEL. THIS HANDLE GRIP MUST BE REMOVED BEFORE THE MILL IS MOTORIZED. YOU MAY ALSO PURCHASE THE 12 INCH CAST IRON PULLEY SEPARATELY FOR $59.95, ITEM NUMBER RP15698.